While the usage of mHealth devices and applications have already found themselves an entry into clinical trials, everyday medical practice of several doctors, and into the lives of many health-conscious users and patients. mHealth industry, growing by the widespread acceptance of mHealth devices and users around the world is on a steep growth ride. However, the ride is still missing a wide scope of growth. There are a number of healthcare stakeholders that have still not warmed up to the idea of switching from their legacy system and coming to mobile. The reasons behind this gap, which we would look into later in the article, is what is keeping the mHealth industry to go completely mainstream – something that can easily be handled by mHealth service providers already into or planning to enter the segment. Before going into the part of healthcare app development guide that entails the mHealth app development considerations that would be required to fill the gap and create an app that offers real value to the millions of healthcare stakeholders across the globe, let us look a little into the state of the mHealth market as seen to be prevalent today. Now that we have looked into the present state of the mHealth market, let us give a brief look to the journey to how mHealth industry hs originated, marking the beginning of Healthcare 3.0. The state of the mobile health app services market that we just saw is the doing of the evolution that the Healthcare industry has seen – from once being a strictly face-to-face operative industry to now being one that has shifted on patients’ and doctors’ palms and fingertips. The need for being in the same area what was once so imperative has become an in-emergency case an only necessity. 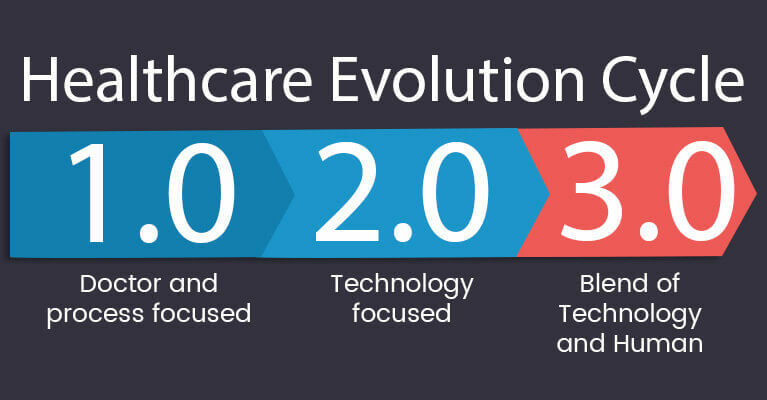 This healthcare evolution shift from 1.0 to now 3.0 is something that we have talked about in-depth before. And the conclusion that we drew then is the same as what we are seeing now – Healthcare has evolved to a place where patients and doctors interact with a screen, the industry is more real-time, and the cases of medical emergencies are in greater control. The healthcare world is now divided amongst a number of app categories with each looking at one or the area of the medical apps for healthcare– From getting consultation from doctors on mobile to getting medicines delivered on the doorsteps and from apps giving you constant notifications to take medicines on time or ensure that you are following your post-operative care properly. But even at a time when a good portion of the health care apps domain has become participative to the era of mobilization and has brought both health and care on the world’s fingertips, they are yet to go mainstream. 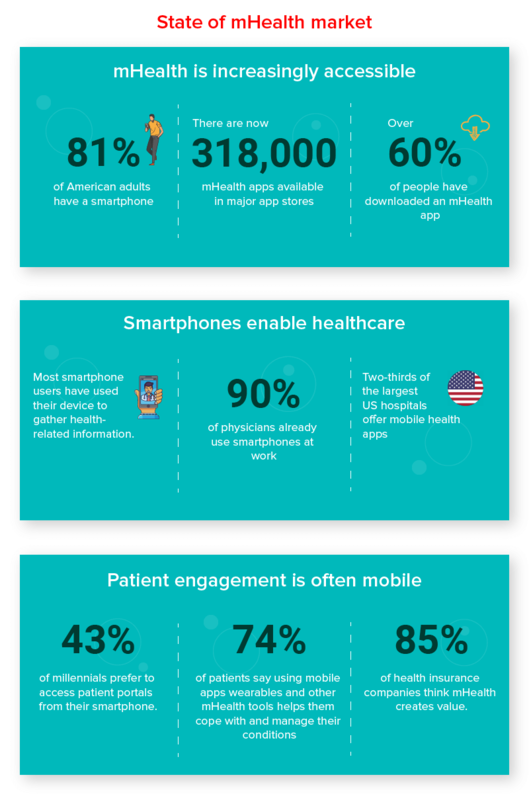 Now there are a number of reasons why mHealth has not been able to create a groundbreaking impact in the life of the medical stakeholders and has not been able to bring a revolutionary global switch from traditional healthcare to mobile healthcare. Understanding the reasons why mHealthcare is struggling to create a lasting impact in the lives of millions seeking real value in real-time would help you devise your mobile app in a way that you become a nudge for those stakeholders who are on the fence measuring whether or not they should bring their medical life on mobile. On this exact note, let us move on to the next part of the healthcare app development guide – the reasons why the healthcare industry is thinking multiple times when it comes to coming and staying on mobile. There are multiple reports doing rounds all across the internet hinting at an event that shows how doctors and patients alike have not smoothened to the idea of bringing the medical word on a platform that is assumed to be unsafe. Let us delve a little more into what the stakeholders think that mobile healthcare lacks which they would like to be filled before they make the switch from their legacy system. Knowing this would help you understand what to know when developing a healthcare app. What businesses entering the mobile health domain more often than not fail to understand is that their stakeholders will never behave like the stakeholders of a super app offering multiple things in a single app. When a doctor or patient installs a mHealth app, they are almost always looking for the redressal of 1 issue (which then can have many different strings). They come to an app searching solutions for 1 issue and not multiple. So, instead of having an application that solves multiple issues on the surface level, a mHealth app that addresses 1 issue in its utmost depth is what would come in handy. There are multiple compliances bodies around the world which are responsible for taking care of how the mobile health domain is behaving. How safely it is treating users’ data and what provisions it is maintaining to check the authenticity of the data, information, and advice mentioned in the application. While getting a seal of approval is difficult but the absence of it is something that becomes one of the biggest reasons behind healthcare stakeholders not believing in the system. The absence of the seal of approval by the FDA or a HIPAA compliant badge in the application’s home screen or in the screenshots used in the App Store and Play Store is also something that is keeping the stakeholders at bay. One of the biggest reasons for distrust in the mHealth solution is the fact that the information entered in the healthcare mobile apps are loosely research and thus incomplete or entirely wrong. You know how it is said that once you enter your medical condition, even if it’s a flu, it will take you to a page which says you have a terminal disease. This saying has been the outcome of people’s experiences not only on the internet but also on mobile apps – something that has left a question mark on the reliability of medical advice shared by anyone other than a medical practitioner. While there still can be solutions that would be in your control to solve all the reasons of mistrust mentioned above – something which we will look into a little later – there is no direct answer or solution to the problem of negative sentiment. Especially when they are valid. There have been many incidents when the picture of ineffectiveness has been presented in the mHealth market. While there are multiple reports highlighting how a great percent of weight loss healthcare mobile apps in the stores pass wrong methods of weight loss to the users, there have been even severe cases where even the most correctly algorithmed mobile apps were unable to identify lesions that were later diagnosed as melanoma. Reasons as these rightfully validate how medical industry stakeholders are rightfully sitting on the fence and not making the switch from their legacy system to the mobile health app services. 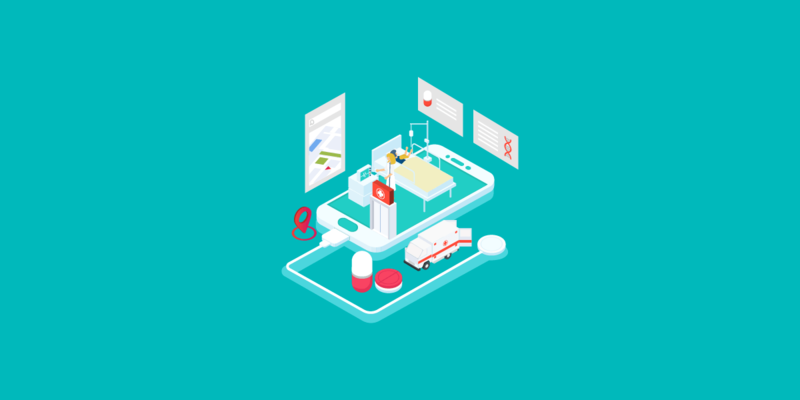 Now that we have looked at the insights that hints at what to know when developing a healthcare app, it is time to look into things that you have to keep into Critical Considerations in Developing Mobile Medical Apps – The last part of our healthcare app development guide 2019. Keeping a note of things to keep to know about healthcare application development will help you in creating solutions that have greater chances of getting accepted in the industry. Well, without any delay, let us get to the mHealth app development considerations that you will have to look out for before you launch your app in the market. The US Food and Drug Administration works with the aim to safeguard public health by ensuring security, effectiveness, and safety of drugs, national food supply, cosmetics, biological products, and medical devices. While it is of utmost importance that your medical app should get FDA approval, what is also important is to understand whether your app is a “medical app” or healthcare app. 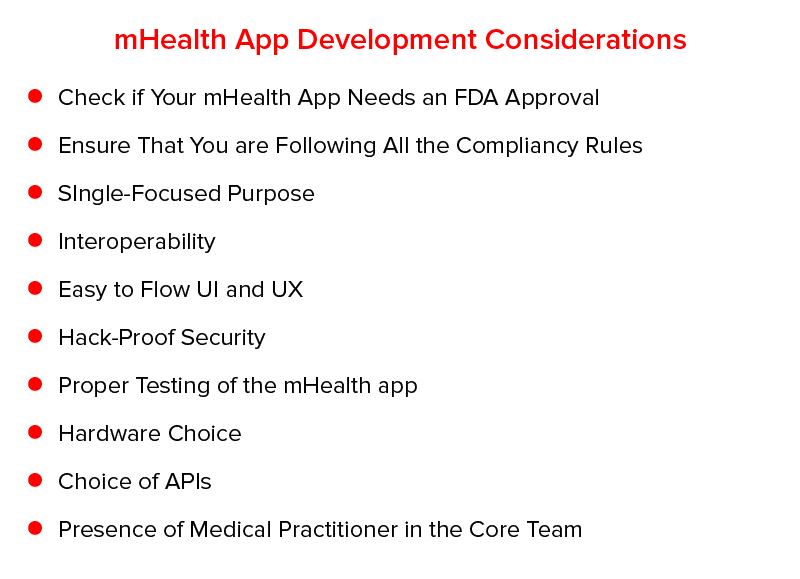 Here are the ways to judge whether or not your app needs FDA. The application controls or connects to the function, operation, or the energy source of the medical device. It converts mobile app in a regulated healthcare device which a licensed practitioner can make use of for treating or diagnosing a medical condition. If the answers to these questions are yes for you, your mobile app would be requiring FDA approval. But if your application will only be used for training and education, administrative functions, or simply for generic aids, you will be not be requiring the FDA approval. There are a number of legal compliances that you have to adhere to when developing a mHealth application. While there are over 50 different compliances, the ones generally most consciously looked after are – HIPAA, HIMSS, FDC, etc. Now just like FDA, knowing whether or not you even have to look at fulfilling these compliances can be very tricky. Let us help you with understanding the basics of how to develop HIPAA compliant mobile apps. It is important to understand whether or not your application will be used for storing and exchanging protected health information. If the app is used to store health information that is not meant to be made public, you will have to get HIPAA compliant. It is not just the health condition itself that counts as a PHI but also other information like contact information of a stakeholder, date when they took a service, etc also count as PHI. So, in case you have the information present in the app, you are compliant for HIPAA. The very foundation of the compliances is to protect the stakeholders’ identity and information. While you can ensure that the data or information that is saved on your app is safeguarded, you will also have to ensure that the same security measure is followed in communication channels as well, like Skype or email or whatever platform you utilize to communicate with your stakeholders. Even if you manage to make a HIPAA compliant mHealth application, you will still have to ensure that the push notifications you are sending for marketing purposes are also following the compliance rules and are not showing any personal information of the patient as notification. Although a little difficult to believe, there are some app ideas which can, in fact, make your mobile app fall into the definition of medical devices according to the definition shared by the FDA. So, ensure that you go through the definitions and check whether or not yours is a medical device, technically. There are a number of app categories operating in the healthcare market – fitness tracking, postoperative care apps, appointment booking apps, etc. What works for apps that excel in these respective fields is the fact that they focus single-handedly focus on one app category and not run behind giving multiple offerings within one application. When companies focus on a single expertise area, they are able to offer in-depth value to the stakeholders and answer their exact pain points in utmost detail. So, what we would recommend is that you should keep your complete focus on one service instead of offering multiple features and services within a single platform. Passing information from one device to another is the essence of mHealth apps. It is imperative to develop a clear line of interoperability which is real-time and 100% secure. There are a number of apps in the market that work in the line of getting all the consolidated data from different health-based wearable devices and placing them on users’ apps in a way that they have complete information about their vitals in one place. In order to ensure that the experience is very smooth, you will have to ensure that the connectivity you are offering is absolutely seamless and one offering heightened value to the life of the users. Imagine all the situations where a stakeholder usually opens a mHealth application. And see how all those situations are more often than not are the doing of a condition of urgency – the urgency of consulting a doctor, the need to start with the fitness regime, the required promptness to fill in the detail of the home visit in the app, etc. Now imagine doing one or a few of these urgent tasks in a mHealth application that takes stakeholders through multiple clicks and processes and even then is cluttered enough to not show what is to be done in a clear space. Would be a turn-off, no? It is. The presence of a bad UI and UX in the mobile app in many ways are the doom of a mHealth application. So, ensure that the design strategy that you are making is the one that ensures you give a simple and in most cases a quick in and out option to the stakeholders. There are no two ways around the fact that your mHealth application has to be absolutely hack-proof and there is not even a single blank left to be filled which can get hackers in. Although, when you develop an app around the legal compliances like HIPAA or HIMSS etc., there is a level of security that is already adhered to, it is still your top priority that your app is 100% safe from breaches and data thefts. In addition to safeguarding your mHealth application from any security breach loophole, it is also equally important to ensure that the device it would function on is protected. Now, while you cannot make your users take measures to keep their devices protected, you can make it a mandate for them to put in a screen lock before accessing your app or you can even give them a lock within the application. Testing, in case of any app category, is anyway very crucial. There can be n number of dire consequences if you launch your application without any proper in-depth testing. It cannot just lead to leaving a negative image in the market but also can open you to your expensive lawsuits. Test the functional working of your app, specifically healthcare workflows. If yours is an app that requires geolocation to function properly, check that the APIs that you are using to enable it are safe. If the app interprets the data from multiple inputs, check all the inputs in multiple units from a different network, device, and locations. Do an in-depth usability testing of your app. The app that you are planning to launch does not necessarily have to function on a smartphone. It can be a wearable app or one whose one version works on desktop and other on mobile etc. Either way, as business people looking to enter the mHealth space, it is very important to understand that there can be multiple hardware choices where you would be able to push your application. And likewise, there can be instances where it would be needed to make two or multiple devices interact from each other – in a situation under which, you will have to ensure that the hardware devices that you choose can actually co-work. Application Program Interface is a very handy functionality that sees its usage in multiple stages across the whole mobile app development process – from users onboarding through social media login API to giving the medical app developers a possibility to connect the app with some server or database. With so many APIs functioning in the market, it can be a difficult choice to shortlist and go with the one that would not just make your processes real-time but also completely safe and hack-proof. But, in order to offer the health and fitness apps service to its complete perfection, it is absolutely important that you make the right API choice. The number one issue that the stakeholders face is in terms of mistrusts that originates out of incomplete or wrong information being presented in the mHealth app. This one problem can easily become a deal breaker for your mobile app both in terms of the image it has presented and in terms of legality. 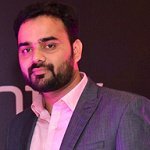 The fact is solving this one problem is something that is in your hand – you can easily ensure your smartphone health app is delivering the right information by having a medical practitioner in the team – someone who would validate the accuracy of the information that you are sharing with the stakeholders. So, here were the 10 considerations that when you keep a note of would help you in delivering solutions that offer real value to the stakeholders while being a medium that they can trust and get comfortable using. Now that you know the reasons that have been keeping medical stakeholders at bay and the points that you have a factor in when investing in Healthcare application development, it is time to get started with it. Get in touch with a HIPAA Compliant mobile app development agency that knows what it takes to create and launch a successful application.